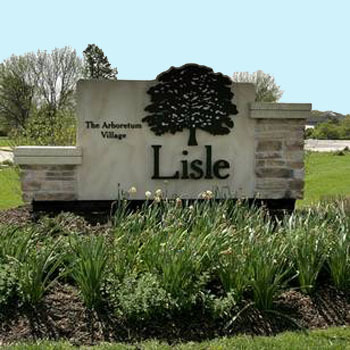 The Village of Lisle, Illinois is known as the Arboretum Village. As “The Arboretum Village,” Lisle has an incredible collection of mature trees and foliage throughout. Nature plays a dominant role in such subdivisions as Green Trails, which is nestled in 744 acres and includes 25 miles of trails, 9 lakes, 17 public parks, mature woods, grassy open spaces, gentle hills, and flatlands. Lisle has a wide variety and range of housing options within the community including single and multi-family residents, duplexes, townhomes, condominiums, apartments, and senior housing. Lisle is part of the Chicago metropolitan area and the Illinois Technology and Research Corridor. It is home to The Morton Arboretum, Navistar, Molex, Unilever, McCain Foods, Hapag Lloyd and Thomson Reuters. Neighboring communities include Downers Grove, Warrenville, Naperville, Woodridge, and Wheaton. In 2007, Lisle was named one of Money Magazine’s Top 20 “Best Places to Live” In America. Lisle, Illinois is located just 25 miles west of in DuPage County. The Village is situated in the heart of a major transportation network which includes three airports, interstates, rail and bus service. O’Hare International Airport and Midway Airport are 30 minutes away and provide global connections. Neighboring DuPage County Airport welcomes corporate jets and private planes. Lisle is at the crossroads of I-355 (north/south tollway) and I-88 (east/west tollway), providing quick access to the Chicagoland region. Train service transports commuters to Chicago in 35 minutes. Lisle has 100,878 households (2010 U.S. Census) and a population of 22,757 (2013). The median family income is $103,973 and the average age is 39.5. The median home values in Lisle are $274,794. Lisle has 4,769 Single Family Homes; 3,327 Apartments; 1,206 Condos; 595 Townhomes; and 116 Duplexes. For additional information on Lisle Real Estate, contact a Real Estate Broker at Wenzel Select Properties. Call (630) 430-4790. If you are interested in purchasing a home in Lisle, we invite to visit our property search page to look for homes available in Lisle, Illinois. Lisle is served by 2 public school districts, Lisle Community School District 202 and Naperville School District 203. In addition to their high level of academic achievement, both districts were recently recognized nationally for providing quality education at a reasonable cost to the taxpayer. Two private schools are also located in the Village of Lisle, St. Joan of Arc School (Elementary School) and Benet Academy (High School). Lisle has 2 Universities and a Technical Institute. Forbes ranked Benedictine University among the best undergraduate institutions in the U.S. National Louis University offers bachelor’s, master’s and doctoral degrees in Education, Business and Management, Health and Human Services, Social and Behavioral Sciences. UTI-Universal Technical Institute the 187,000 square foot state of the industry campus in Lisle provides training for students seeking careers in the automotive industry. The Lisle Library has a collection of approximately 170,000 items, including books, e-readers, audiobooks, music CDs, feature film and television series videos, computer games, and more. The entire building is equipped with WI-FI. The library’s meeting rooms are available free of charge to library cardholders for most non-commercial uses. Youth Services offers a broad range of story times, programs, and crafts for all children and teens. The Lisle Park District offers a wide array of recreational options including the award-winning Sea Lion Aquatic Park and River Bend Golf Course. The Village of Lisle/Benedictine Sports Complex hosts a variety of sporting and outdoor exhibitions throughout the year. The world-renowned Morton Arboretum encompasses 1,700 acres of woodlands, wetlands, prairies, lakes, and meadows. The Morton Arboretum is the perfect place to walk, bike, enjoy cross-country skiing, take a guided tour, see art exhibits, enjoy theater hikes, take a variety of classes, capture the beauty of nature on canvas or on film, and bird watch year-round. The Arboretum’s activities include the award-winning interactive Children’s Garden, The Maze, a diverse range of year-round activities including nature classes, Theatre-Hikes, and cross-country skiing. Residents are delighted by the many recreational options the Village offers. The Bulls/Sox Training Academy offers youth the same high tech training/coaching techniques used by the Chicago Bulls and White Sox. The annual Eyes to the Skies Hot Air Balloon Festival, Lights of Lisle Holiday Festival and the French Market are just a few of the many exciting events in Lisle.